Father Moon was a man of endless compassion, courage and love. He was a man with a vision, ‘to liberate humanity through the liberation of God’. From a very young age he devoted his life to not only vocalizing this message but also acting on it. It is easy for us to simply say what we believe in peace, unconditional love or human rights, but to go out into the world and endure hardship and barriers both social and political is something to be commended. Father Moon travelled the world visiting one hundred countries in one hundred days without taking a break. In each country he left an imprint of his message by changing someone’s life be it supporting the Jerusalem Declaration or clearing blood between old enemies. Please click on 'Dim Lights' to open up a bigger version, then click anywhere on the side of the document to return. 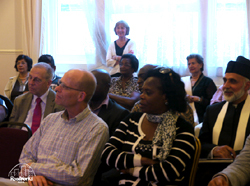 Robin Marsh and Margaret Ali welcomed UPF's Ambassadors of Peace, friends and newer members of the Youth UPF on Tuesday 30th July at Lancaster Gate. The event was enjoyed by all as they were reminded of UPF's core values of being One Family under God, and how it is natural for all to be Living for the Sake of Others. 'I have enjoyed myself very much and have a lot to say next time we meet', Peace Aryee said, grabbing my hand as I was saying farewell to people at the end of the event. Last night was a very special, intimate, inspiring afternoon tea with Ambassadors For Peace (AFP). For the first time we had around ten young people who joined over thirty AFP. The evening started with people gathering in the Lancaster Gate Café discussing, chatting and having snacks. It felt like a big rendezvous and when the young people started coming in one by one, it didn’t feel awkward as we were welcomed at their tables. 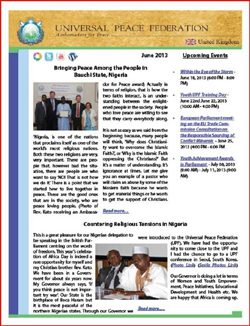 Please click on newsletter image to read or download.